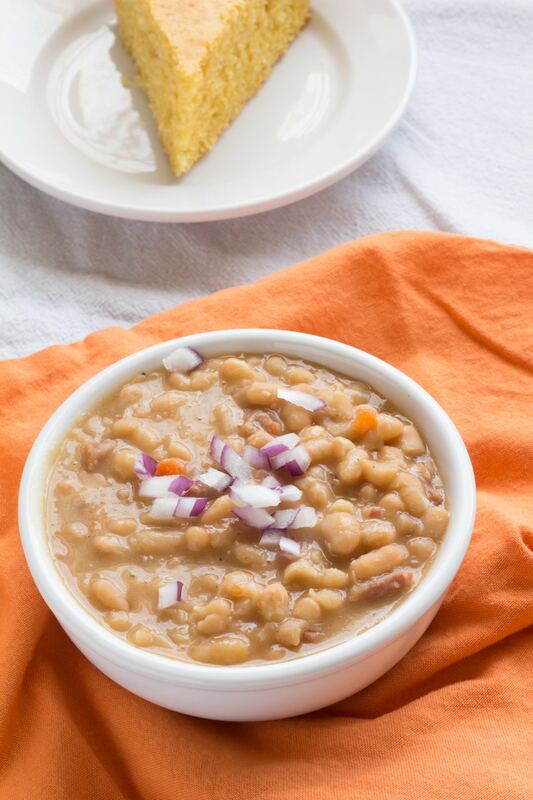 Ham and beans is a delicious bowl of good old southern comfort food chock full of white beans that have been cooked in flavorful ham broth! The ham and beans start with nicely flavored broth or stock. I find the best flavor comes from using a smoked bone-in piece of meat. Additional flavoring can be added by using a ham base or even chicken stock. I prefer starting with smoked ham hocks. Next up would be a leftover Easter ham bones. Any holiday really. I see turkey and ham served side by side at tons of holiday meals! I don’t use the meat from the ham hocks for adding to the soup as I find there is just not enough meat. 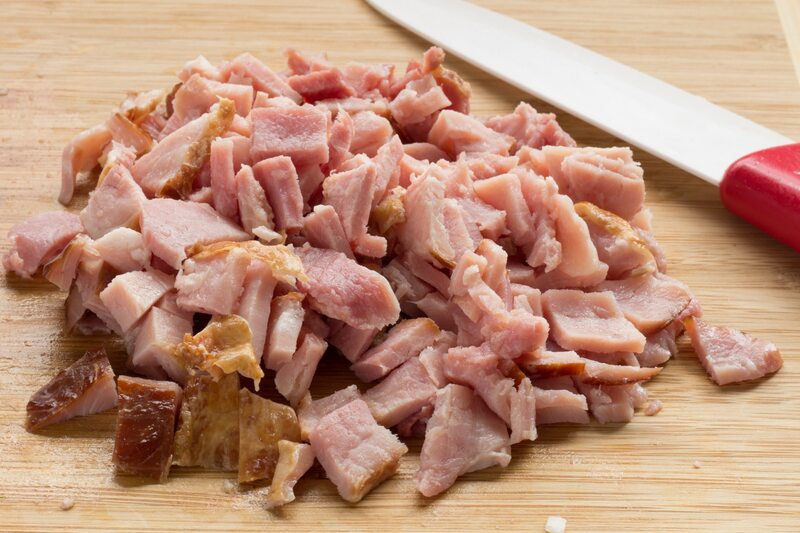 Instead, I use ham pieces because they are relatively cheaper than other cuts of ham. I chop it into smaller pieces and add them right at the end of the cooking time. I have used deli ham diced into smaller pieces and the soup still had it declared the best ham and beans! The whole point is any kind of ham can be added. 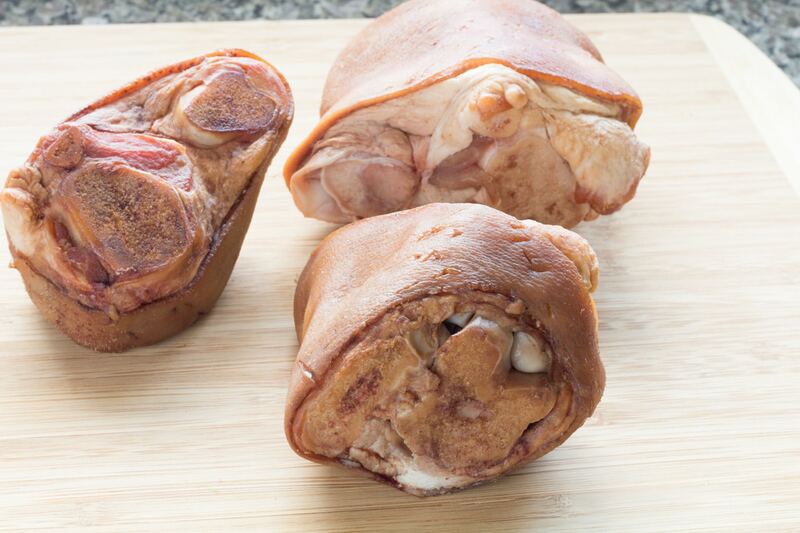 My mom, grandma, and aunts always used the meat off the hocks so if you are in this camp, go ahead and use it. I think it’s too much work. Ham base or bouillon is another option if you don’t have any ham bones or hocks to use. Just be careful though, ham base can be pretty salty. Taste the broth before adding the beans! Add more water if you to in order to cut some of the salt. Onions and celery are the only vegetables I add to the broth while simmering the ham hocks. These will be discarded before the beans are added. Once I have strained the broth, I add fresh finely diced onions and carrots back into the broth before adding the beans. I like the added color and touch of sweetness the carrots add. Both of these can be omitted. Garlic can be added to the simmering liquid as well as the finished soup if desired. Many of the white beans can be used interchangeably if they end up with a soft, creamy and somewhat delicate texture. I know that sorting beans sounds like something old fashioned like scalding milk but it is still necessary in modern times. Little pebbles and shriveled up beans still make their way into the dried bean supply! Shriveled beans will not plump up like the rest of the beans. They aren’t bad, they just won’t be as tender or pleasant as the rest of the beans. The little pebbles need to be removed because they will break teeth! I usually take them out by the handful and sort through them and place the sorted beans into a colander. Some people dump them into a bowl or onto a cookie sheet and sort through them that way. I find that I miss shriveled beans and rocks doing it that way. I like to have my hands on the beans so I can feel them. Once the beans are sorted, put them into a colander and give them a good healthy rinse. If rocks can be found in many bags of beans, I feel like there may also be dirt and other junk on the beans. 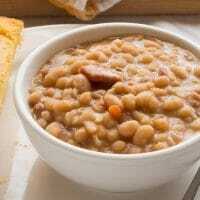 Navy beans are smaller than great Northern beans and will work just fine in this recipe. These little guys take longer to cook up than the larger beans. I know, it doesn’t make much sense, but it’s the truth. Navy beans will also break down more than the other beans, making them ideal for ham and beans. These are my first choice! Great Northern Beans look very similar to Navy beans but larger. Honestly, I think growing up we were eating Great Northern Beans and my family just called them Navy beans. Great Northern beans will cook up in about half the time of Navy beans. This my second choice! Cannellini Beans can also be used. 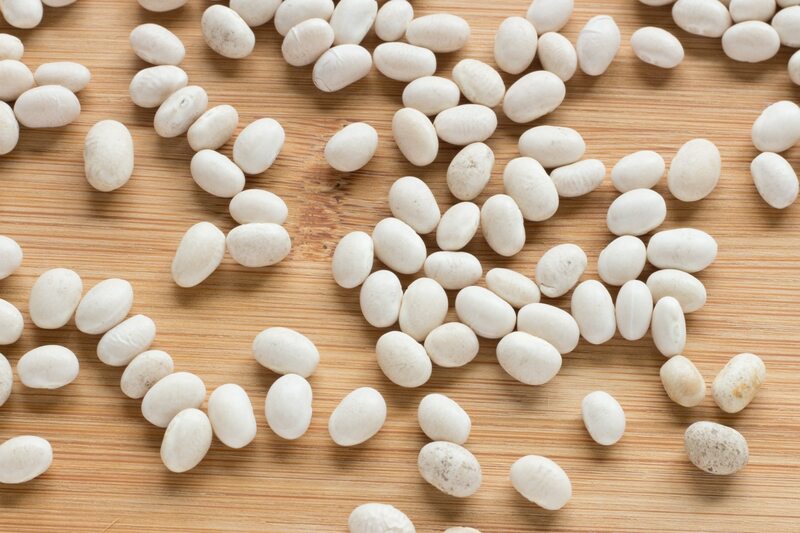 They are the largest of the three white beans suitable for ham and beans. These beans will retain their shape better and may require some additional smashing or pureeing of a few beans to add some thickness. I prefer saving these beans for minestrone soup. DO THE BEANS HAVE TO BE SOAKED? Nope, and I never do. I don’t usually have room in the refrigerator for a bowl or pan large enough to hold enough water for the beans. I also find that it doesn’t save me much cooking time anyway. Beans do need to be sorted and rinsed though. Beans can be soaked to reduce the cooking time. Soak beans in water for 8 hours and up to overnight. Be sure to drain the water and start with fresh water before cooking. 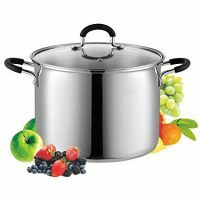 A quick soak is done by bringing a pot of water to a boil, remove it from the heat and add the beans. Allow the beans to sit in the hot water for 1 hour. Soaking beans may or may not reduce gas. The science isn’t very clear on it. CAN I MAKE THIS INTO HAM AND BEAN SOUP? You sure can! Actually, ham and beans and ham and bean soup are virtually the same thing! In my mind one is thinner than the other, but growing up it did not matter if the beans were smashed and added thickness or if the beans were mostly whole and swimming in liquid, it was just plain old ham and beans. Always served with a side of cornbread! Just start with more broth in the beginning. Any time during simmering you think that it is getting too thick, add some more water! I suggest using great northern or cannellini for ham and bean soup though as there will be less broken beans. Broken beans will thicken the broth considerably. 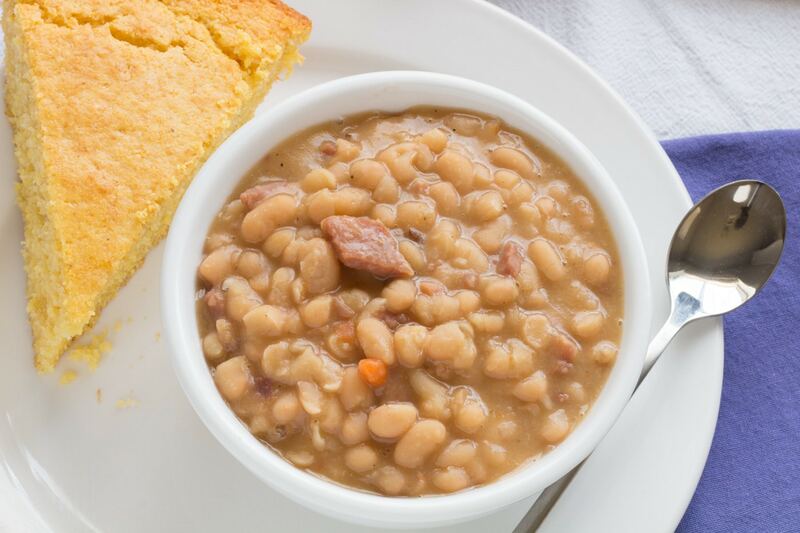 Ham and beans with cornbread is considered a complete meal where I come from. So Buttermilk Cornbread tops off the list. Buttermilk Cornbread – In our opinion, this is not a suggestion but a requirement! 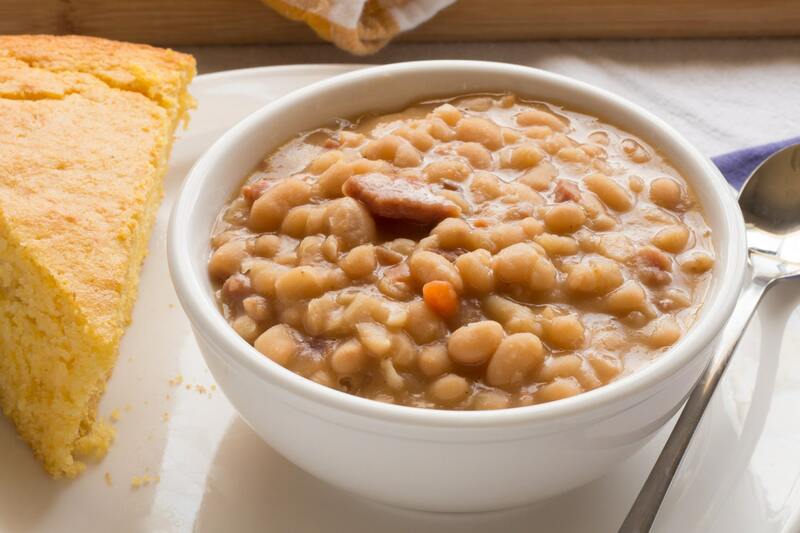 Southern comfort food chock full of navy beans cooked in flavorful ham broth! Peel the onion and cut into half, and place one half into a large pot. Set the other onion half aside for later. Add the ham hocks or bone into the pot and cover with enough water to cover the bones. Place the pot over high heat and bring to a boil then reduce the heat to a slow simmer and allow to simmer until the ham hocks have started to seperate, about 1 to 2 hours. Remove the bones and onion from the broth and allow to cool before removing meat from the bones if using. Continue simmering the remaining broth. Sort and rinse the navy beans and add to the pot. Add enough water to cover the beans by at least 2 inches. 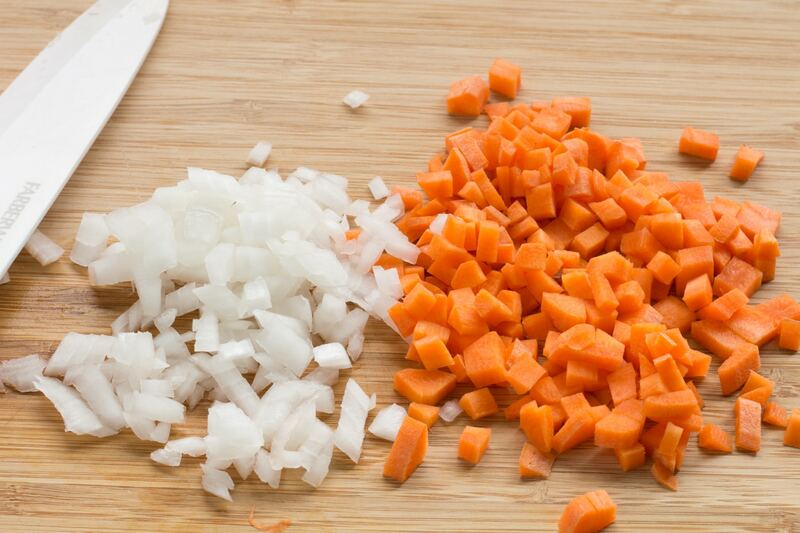 Peel the carrots and finely dice. Add to the ham broth broth. Finely dice the remaining onion half and add to the broth. Bring the beans to a boil while stirring occasionally. Once the beans come to a full boil, reduce the heat to a low simmer. Continue simmering beans, stirring occasionally until the beans are completely cooked, about 2 to 3 hours. Add additional water as necessary to keep the beans just covered during cooking. Serve hot with a side of buttermilk cornbread. Other white beans can be used, adjust cooking time based on the type of beans used. 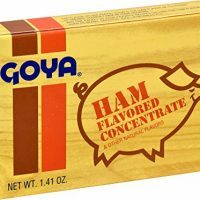 Ham base can be used as a substitute for ham hocks or leftover ham bone. This will only need to be simmered until the onion has cooked down. To make soup, keep beans covered with at least 1 inch of water during simmering.